There maybe a world recession on at the moment, but for anyone arriving at Dubai International Airport’s Terminal 3 they probably wouldn’t believe it, as the queues to pass through Immigration stretch as long as the eye can see. Often during busy times, such as at mid-night, it can take a good hour to clear immigration which is just what you don’t need after an exhausting flight. To the left of these long and winding queues however, there is a very short queue where passengers pass with a mere swipe of a card and a scan of their fingerprint. 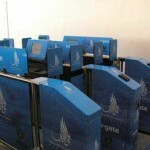 These are the eGate Card counters. Frequent travelers entering and exiting from Dubai International Airport need not wait in a long queue to get their passport stamped, if they use an eGate Card. Simply head to the eGate section, swipe your card, touch the panel to match your fingerprint to the database and then you are through in 5-10 seconds, saving you valuable time. Sometimes the eGate machines maybe down but there is always a friendly Immigration Official to help passengers pass through Immigration quickly and this same official will stamp accompanying children’s passports, as children under the age of 18 cannot get eGate Cards. 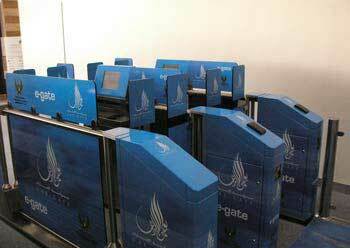 Passengers can use E-Gate at Dubai International Airport, Abu Dhabi International Airport and Al Ain International Airport. 6. DNATA Dubai Airline Centre, Sheikh Zayed Road. Call +971 4 316 6966 for information. You must be present to obtain the eGate Card, bringing with you your passport (with at least 6 months validity remaining) and a passport photo. The whole process of checking documents, doing the finger-prints and photo ID only takes about ten minutes. The card costs 225AED and is valid for 2 years. A similar process is required for renewal. When traveling to and from Dubai don’t leave home without your eGate Card! what is the purpose of this e-gate card and the cost to make is? Does it carries specific expiration?